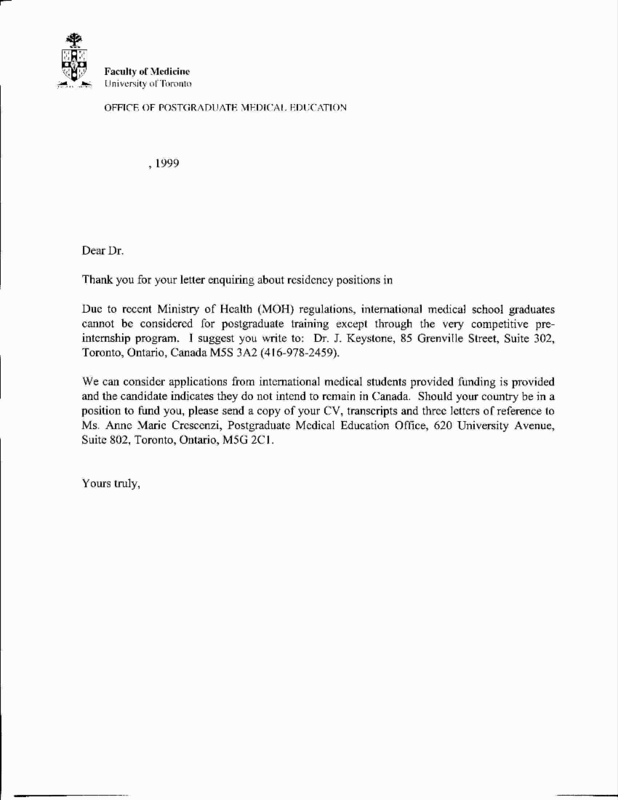 Personal experiences of Canadian International Medical Graduates (including mine) not published elsewhere. 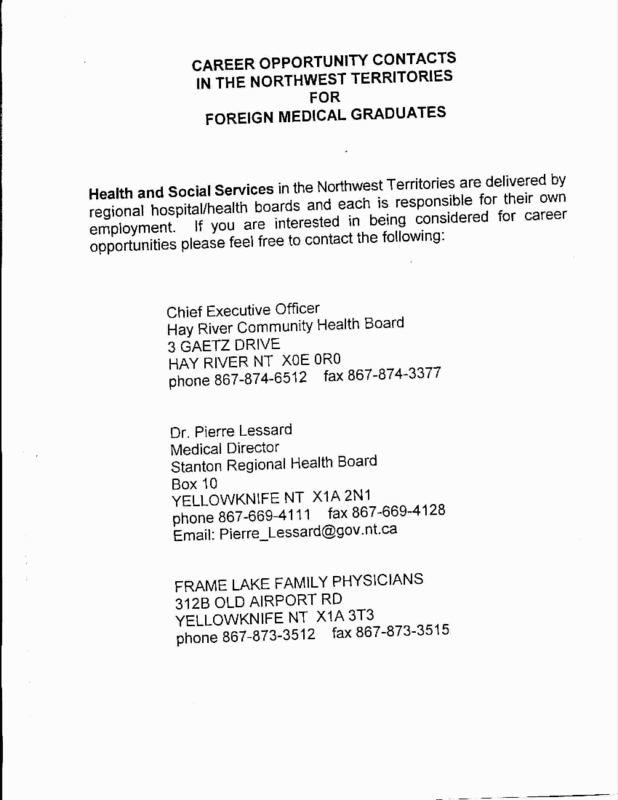 Knowing that it would be extremely difficult to obtain a medical residency or practise medicine in Canada without Canadian training I applied for and secured a residency in the United States prior to landing in Canada (somehow I wasn't made aware of the Health Canada waiver form for International Medical Graduates and I only found out about the form International Medical Graduates have to sign before getting an immigrant visa when I wrote a letter to Allan Rock). 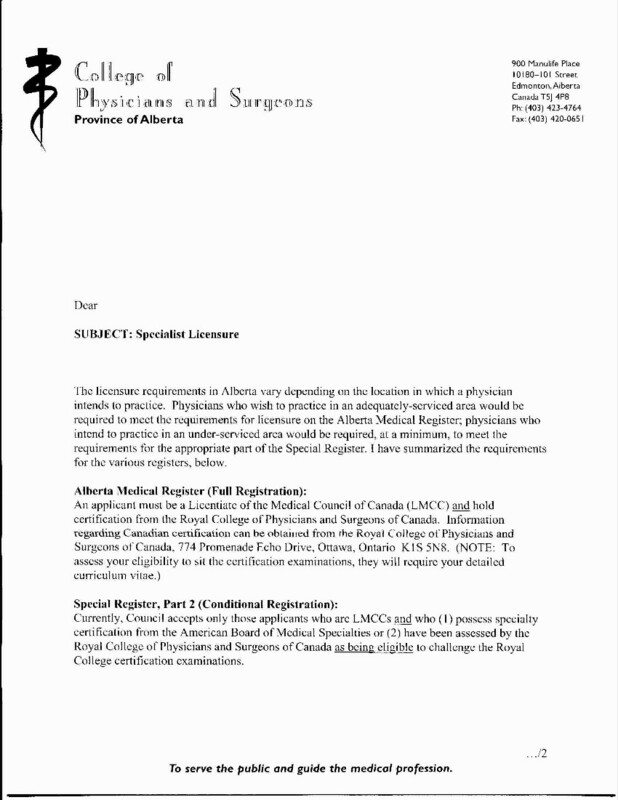 I was able to secure the letter from the RCPSC stating they would recognize in full or in part the specific residency program at the specific hospital I was going to do my residency in (in short it was my understanding I would be able to sit for their certifying exams and thus get a permanent medical licence where I intended to practise upon returning or anywhere in Canada, the RCPSC web site now says there is no guarantee U.S. training will be recognized in Canada, and even if you finish a fellowship in Canada). 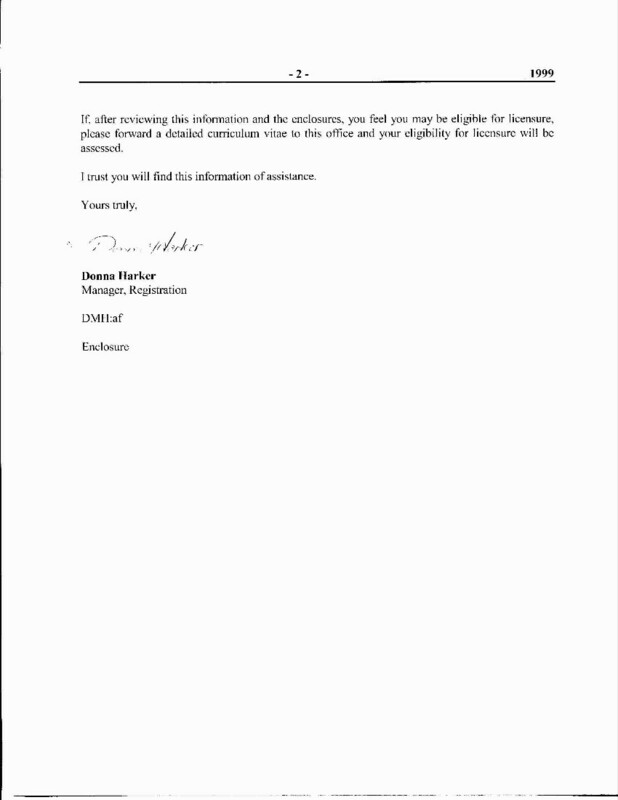 Unfortunately I did not keep abreast of their rule changes during training so when it was time to apply for the RCPSC certifying exams they wrote back (after a couple of months) that I needed to have my training in the U.S. formally assessed (after paying them C$900) but it looked like, on the basis of their present rules, I would need additional training on top of my completed U.S. training even if I passed U.S. certification exams, to qualify to sit for RCPSC exams (only one remarkably prescient doctor out of a couple of dozen people, with the Canadian clinics that I had interviewed with for a practise position thought I would have a problem with RCPSC certification, something that in hindsight should have made me plan better). 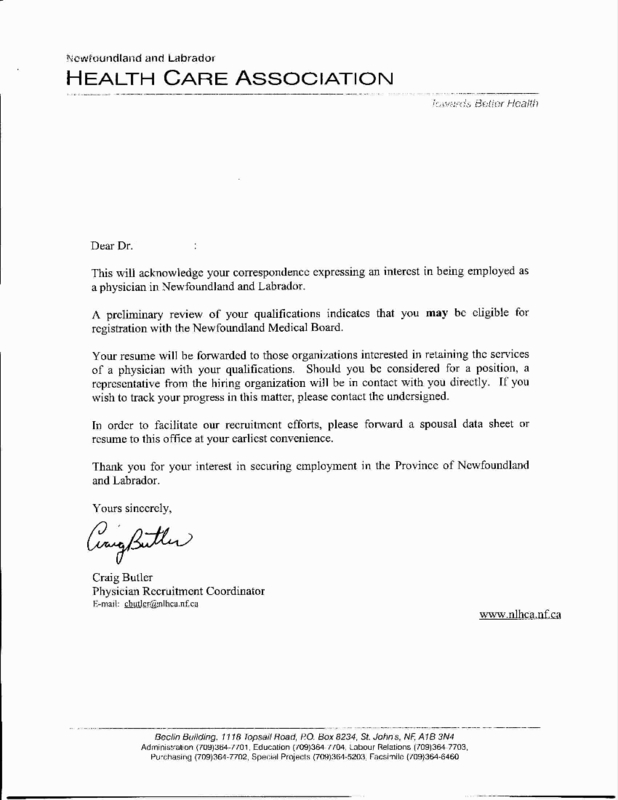 I then wrote the provincial recruiters and medical licencing authorities in Alberta (1), B.C., New Brunswick, Manitoba told me to go to their website, Newfoundland (1, 2, 3), Nova Scotia (1, 2), Prince Edward Island, Saskatchewan, Yukon (1), to see if I could get licenced as an FP and the answer was I could probably get a temporary medical licence in some provinces if I was willing and able (if the registrar thought I had all the required rotations for an FP, in a couple of provinces they stated I still needed more weeks of acceptable OB/GYNE and Surgical rotations even if I wasn't going to be doing OB or major surgery, are all of the Canadian trained FPs in under serviced areas required to perform Caesarians or abdominal surgeries?) 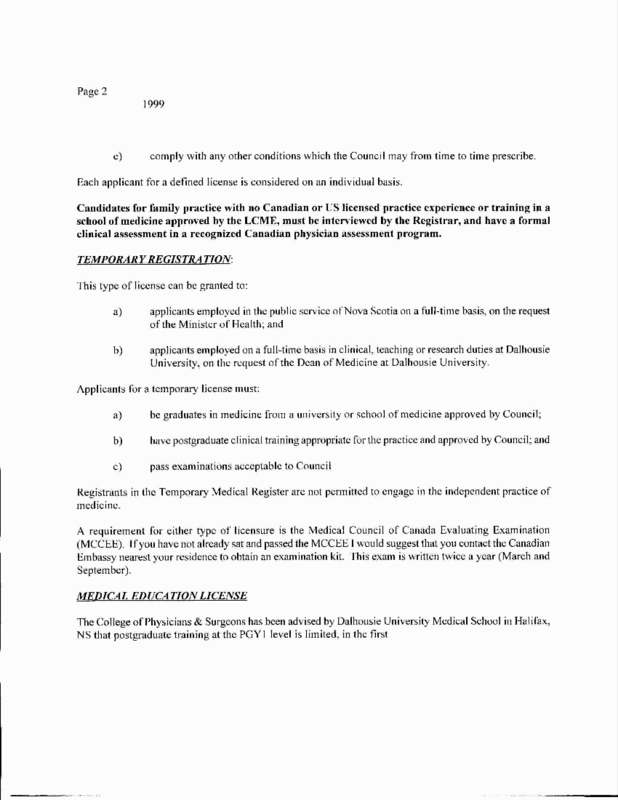 to practise in under serviced areas but permanent licensure would depend on being RCPSC or CFPC certified even if I passed all the MCC exams. 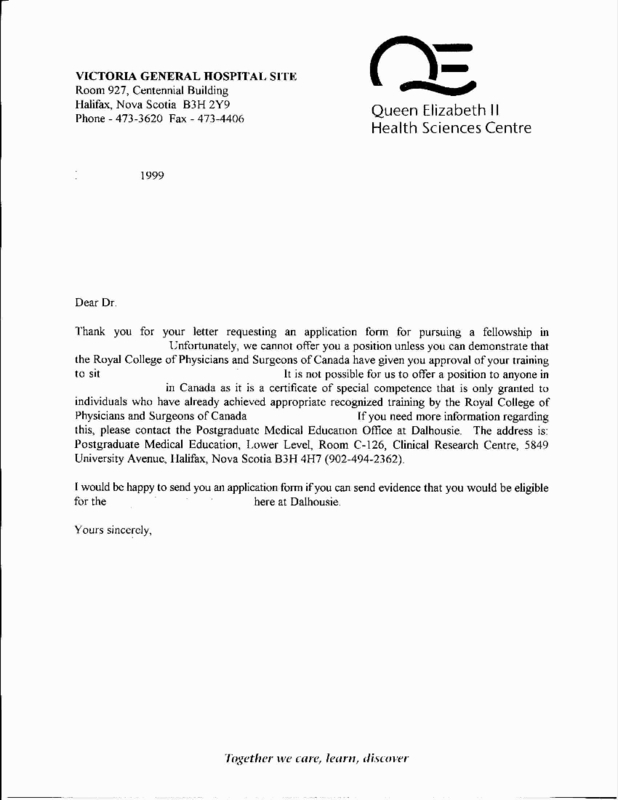 Since I had been on a J1 visa in the U.S. and hadn't actively done any job searches for a J1 waiver early enough, because I thought I would be able to practise medicine anywhere in Canada, and for other personal reasons and since there was no other work I was willing to do I opted to sit out my 2 year home country return requirement in Canada so I have had the time to research the situation of International Medical Graduates in Canada. 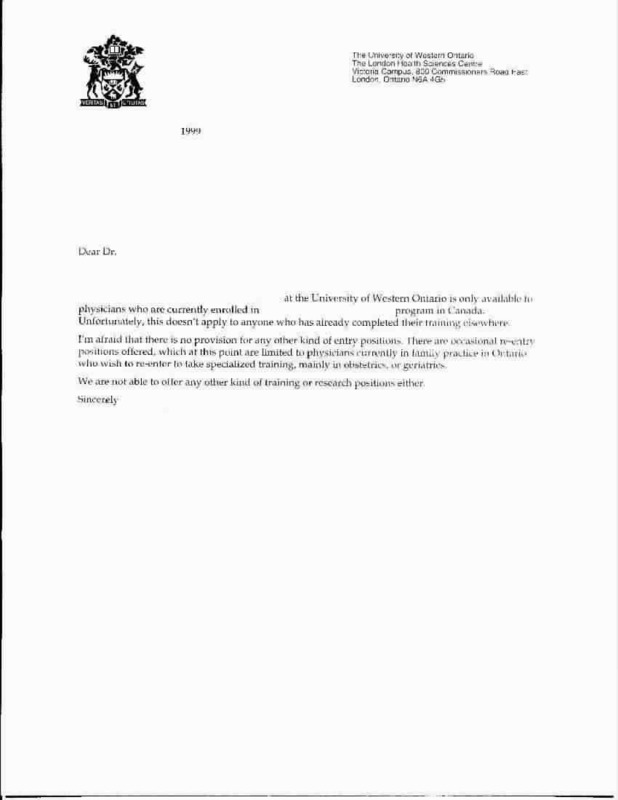 1. we have no available funding at present to take in new students or fellows, if you can fund yourself or get your country (I did tell them beforehand I was a Canadian citizen) or institution to sponsor you we would be happy to consider you (the 2 most common replies, and would they have accepted me automatically if I had the money?). Apparently a lot of Canadian fellowship programs only have provincial government funding for a single first year fellow every other year or even every two years, unlike most programs in the U.S. which have funding every year for more than one fellow. 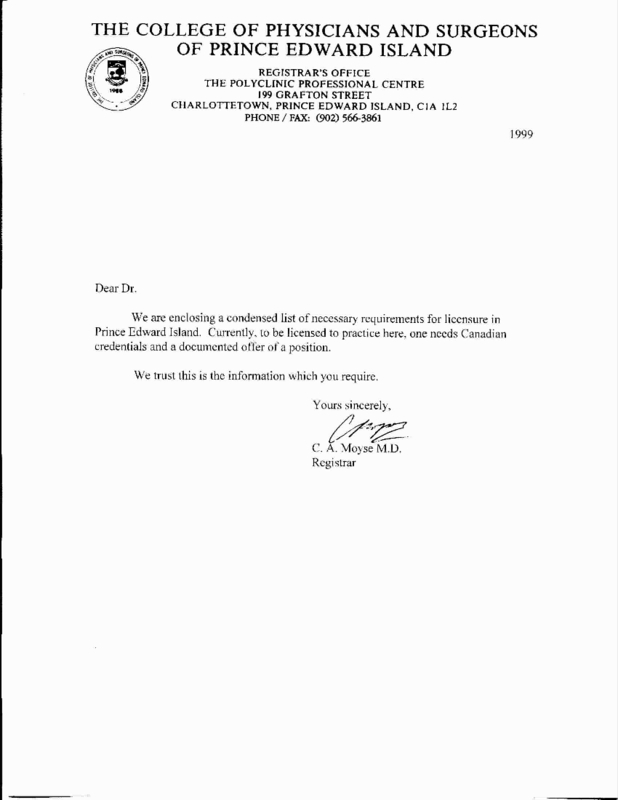 * most program directors and medical school faculty are aware of the 2 year Home Country Return requirement for J1 visa holders, there seemed to be a lot of skepticism as to my avowed plans of staying in Canada even after my 2 year HRR was up and I got the feeling some interviewers didn't want to waste Canadian training on somebody who was likely to go to back to the United States, or they felt there must be something wrong with me for wanting to practise in Canada so it looks like a lot of Canadian International Medical Graduates have tried the same route I attempted. 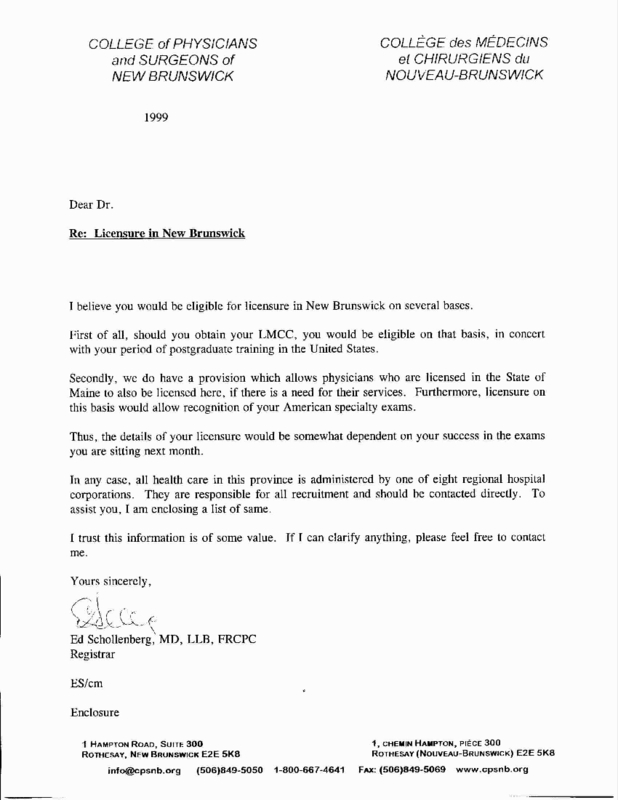 This skepticism would have been perfectly reasonable, given the fact that most American doctors make more money than their Canadian counterparts, however I didn't go into medicine for the money and there are more important reasons than financial ones for my wanting to stay in Canada if I could do my lifework here. 8. is this really your primary career goal (for the Master's programs obviously not, else I would have done it after completing my bachelor's degree instead of going to medical school and if I said it was, I'd be lying). 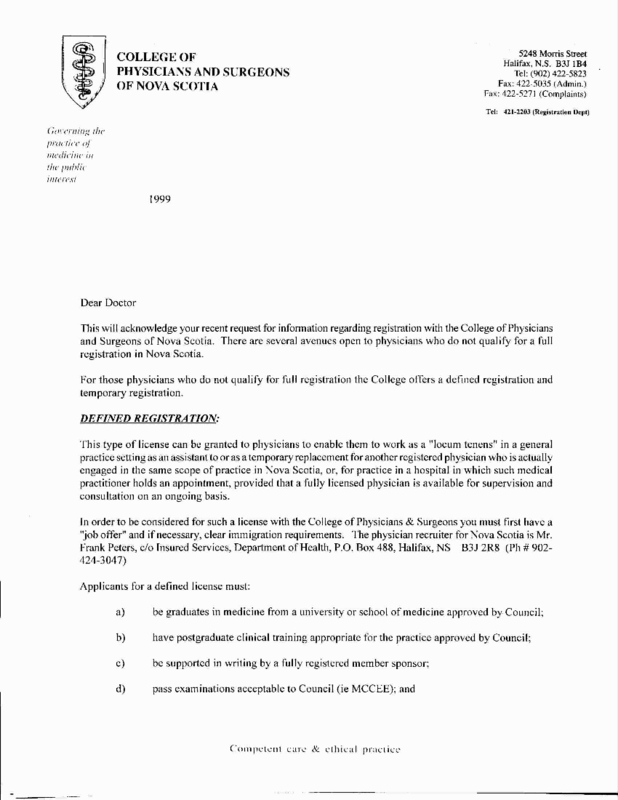 Plus, I was told I would still need to remedy the deficiencies in my U.S. training (read go back and do at least a year of residency all over again even after finishing fellowship) to be eligible to sit for the RCPSC subspecialty certifying exams. In addition some Canadian subspecialty fellowship training programs are shorter than their U.S. equivalents (I guess because Canadian residencies are one year longer than in the U.S.) so there might be problems getting U.S. accreditation for the Canadian training in those programs. 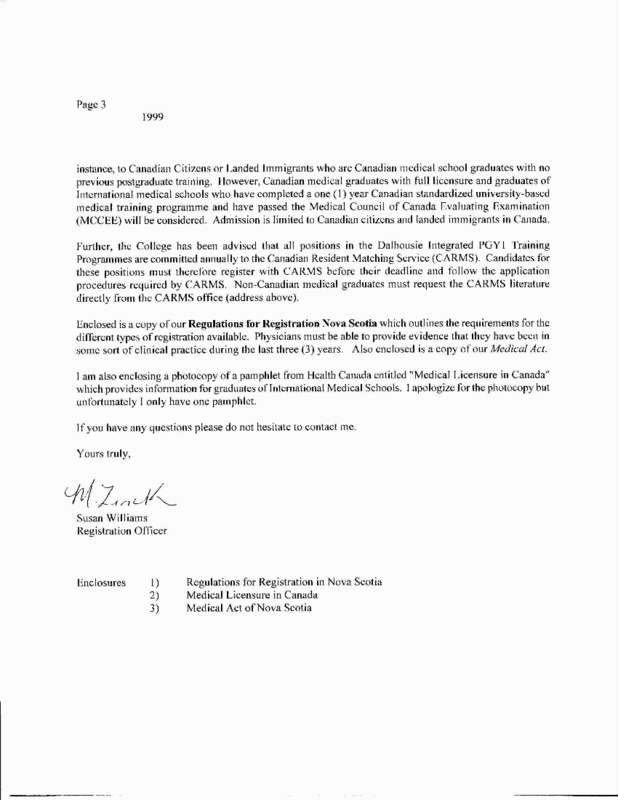 Canadian medical licencing authorities have the right and obligation to ensure Canadians get the best medical care in the world and it is my view this can be accomplished through generally accepted standardized tests such as the MCCQP1 and 2 that Canadian Medical Graduates have to take and the certifying exams (oral and written) that the RCPSC requires plus the regular recertification exams and annual practice audits required by the provincial colleges in some provinces as well as the reviews provincial and subspecialty disciplinary boards do whenever a complaint is brought against a physician. 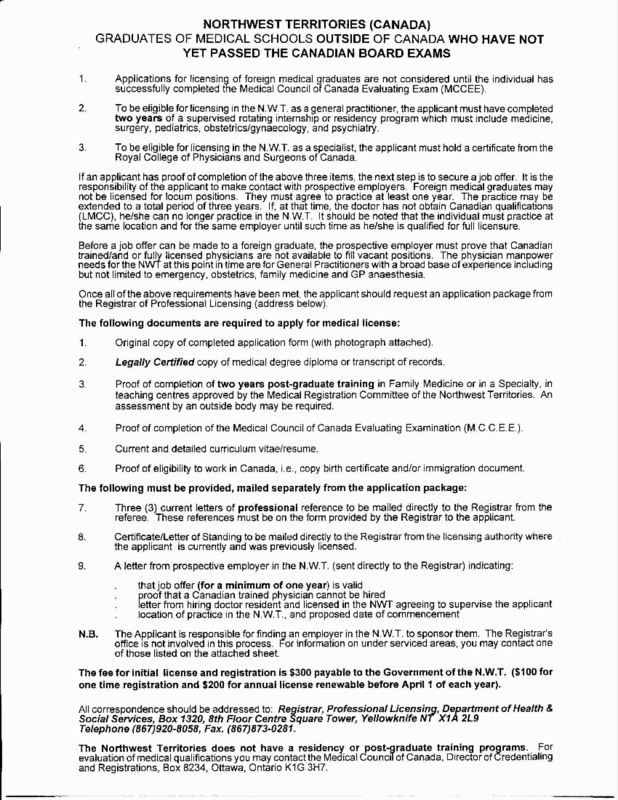 In addition I think it is only fair to require International Medical Graduates to pass TOEFL and the MCC Exams before being allowed to practise in Canada (if you can't understand your patients, staff and colleagues and they can't understand you, even if you know every word in Harrison by heart I don't see any way you can be a good doctor). 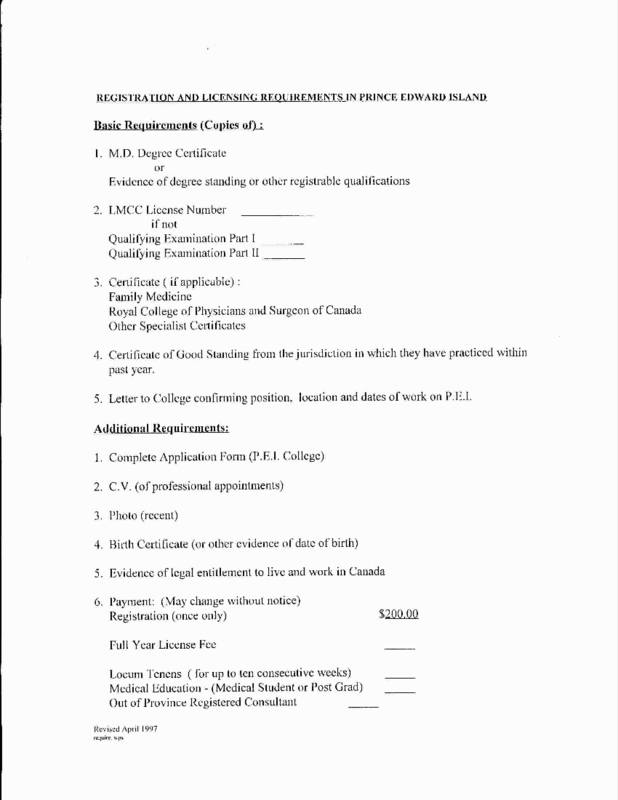 And there are certain local nuances specific to medical practice in Canada that International Medical Graduates, even those from the United Kingdom, Australia, New Zealand, Eire, South Africa and the United States need to be aware of (like the Canadian health insurance system and how to bill, provincial health laws, etc, but does one have to go all the way back to medical school in Canada?). 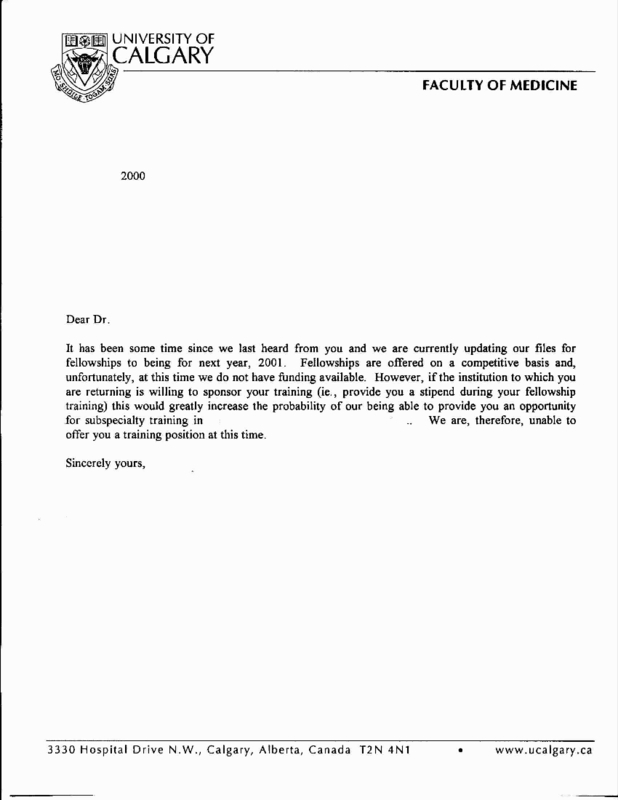 What I don't understand though, is why there still are doctors in Canada (Dr. J.S. Bothma was not an isolated case, and not just from South Africa either) who continue to practise despite being unable to pass the MCC or RCPSC certifying exams (the provincial licencing authorities can extend their "temporary" licences for years) while others aren't allowed the same privileges. Now I don't know if Canadian medical standards suffer because of this or not. 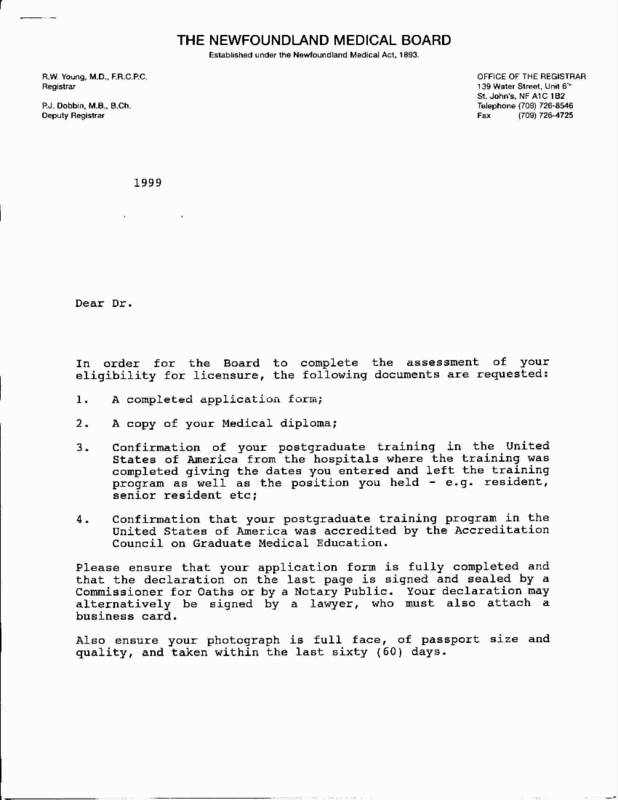 The argument that the licencing authorities are familiar with the educational process through which these physicians from the favoured countries went through (maybe because they were educated in those countries themselves), while it would be almost impossible to check, for example, all the medical colleges in India (a reason that has been aired in print elsewhere) makes them confident that these favoured physicians meet their standards has often been raised. 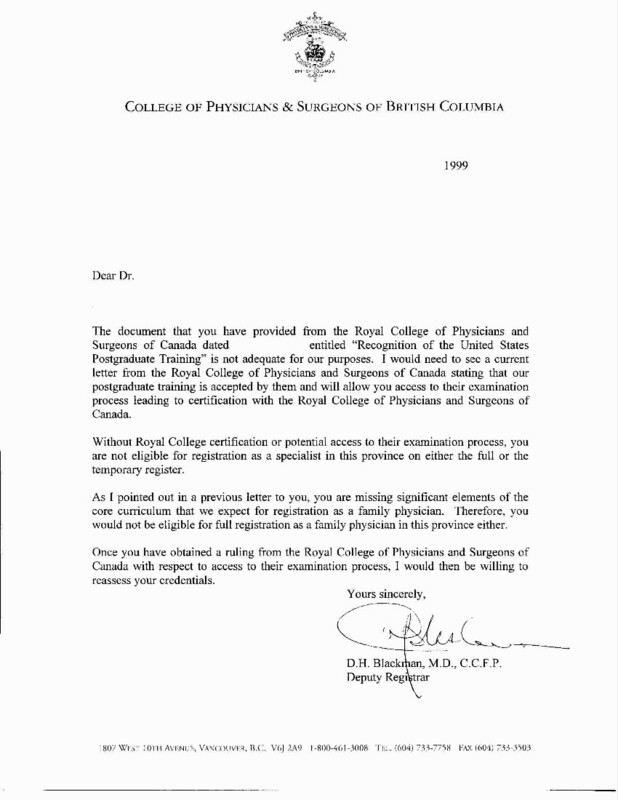 However it can also be argued that the standards of medical education in those favoured countries are different from Canada's and each other (granted they were all under the same monarch for hundreds of years and there were similarities in their educational systems because of that but the operative tense here is were, a past tense), there are individual differences in training between medical schools in the same country, differences in the way individual physicians are trained in the same medical college at different time periods and differences in the way individual doctors practise once they finish training. To say that previous physicians from certain medical schools in certain countries have turned out well, therefore ALL the physicians from those medical schools will turn out the same way thus there is no need for screening them first in the same way physicians from other schools are screened (exams, criminal records checks, etc) stretches the bounds of my credulity (as in the cases of Dr. J.S. Bothma lately of Battleford, SK and "Dr." Dennis Roarke formerly a first year Cardiovascular Surgery resident at the UWO in London, ON illustrate). 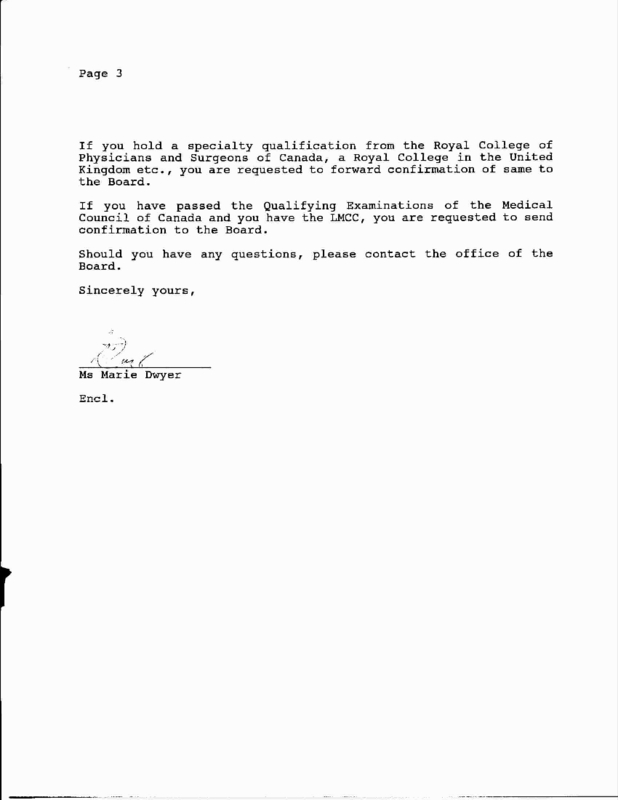 Using the same line of reasoning, Canadian Medical Graduates who haven't taken the MCC QEs or have flunked should be allowed to practice since other Canadian Medical Graduates who passed and have been practising successfully, were educated in the same schools. 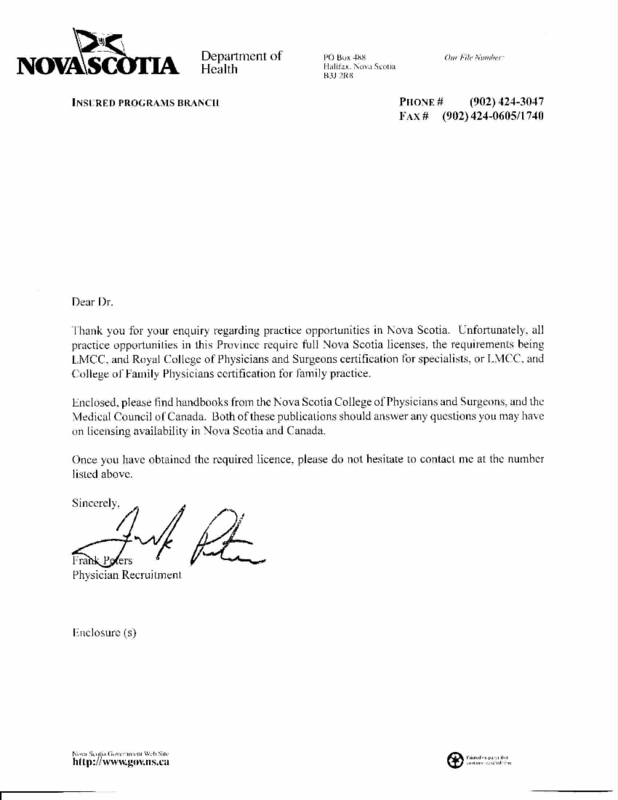 And if it is argued that these doctors practise in under serviced areas where no Canadian Medical Graduates care to go, does that mean that Canadians in under serviced areas don't deserve the same standards of medical licensure as Canadians in other areas of the country? 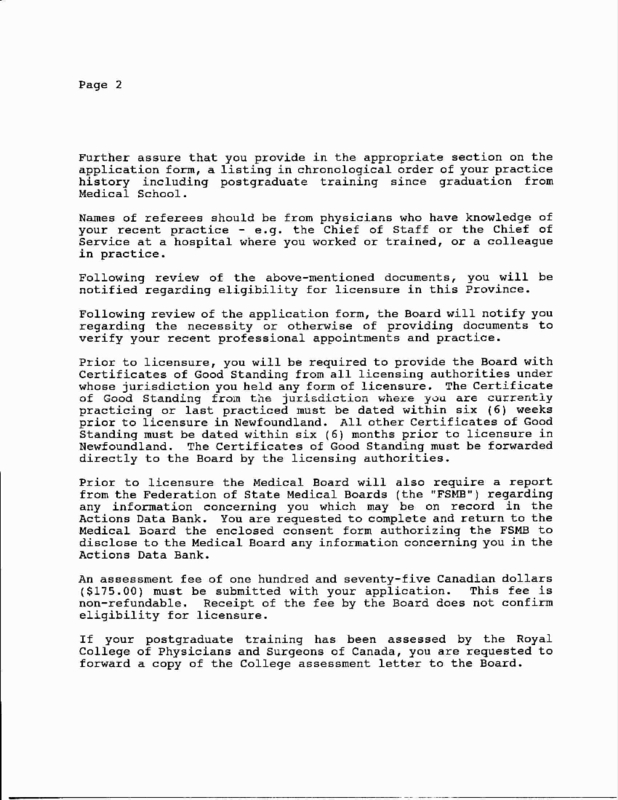 As for the argument that one needs to have been trained in Canada to be able to practise according to "Canadian standards" (and not just because imposing such a requirement limits the number of doctors in Canada and gives those already here more bargaining power over the provincial governments) all I can say is, does that mean the non Canadian trained doctors (25.5% of all Canadian doctors) who have been practising here all these years have been practising to non Canadian standards? And if they have, then why aren't others allowed in, if they have not, why haven't they been weeded out? IMHO the reasoning behind the the exclusion of most International Medical Graduates while making exceptions for the favoured International Medical Graduates, which to me seems to be based mostly on where one was originally educated, in my view a class based bias for making licencing decisions instead of one based largely on individual merit (like passing exams), is an anachronism not suitable for the 21st century in Canada (maybe acceptable during the 1800s'). Since standards are needed, and I can't agree more with those making the licencing (regulatory or certification) decisions about this, then these standards should be applied equally, on everyone, everywhere in Canada (but please not in the completely exclusionary way the CPSO decided back in the 70's). I will put in other people's experiences here. 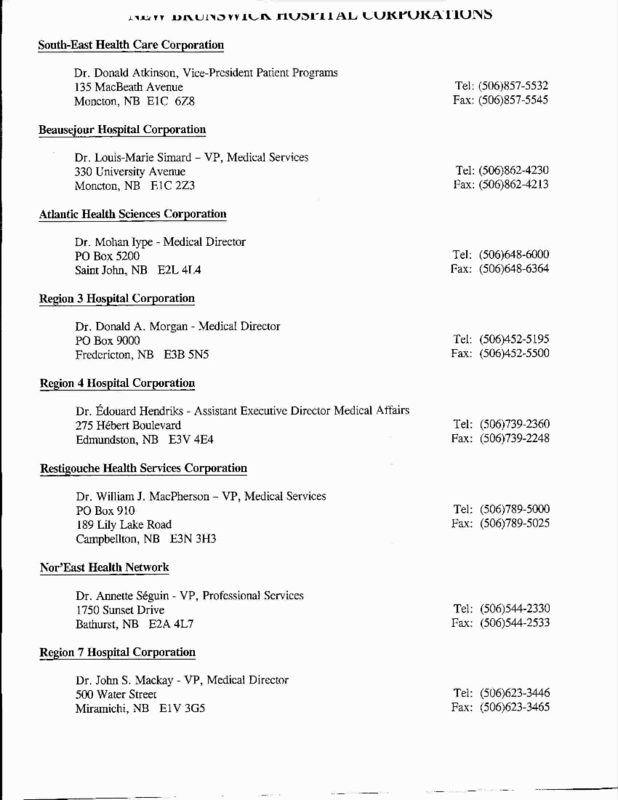 This can be done anonymously and I will make sure to remove any identifying elements if you so desire. A.B. immigrated from Eastern Europe and has been in Canada for more than 2 years. 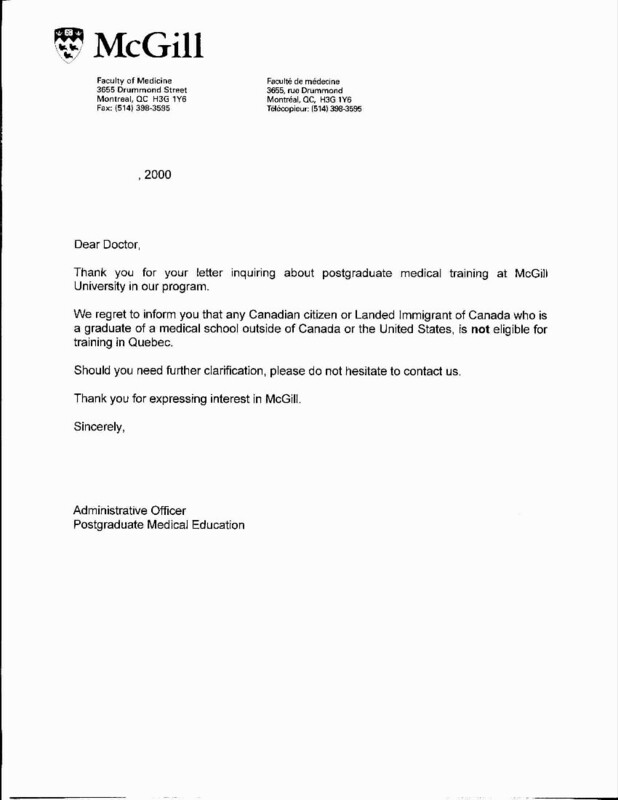 S/He had passed Canadian and U.S. exams but had been unable to get into a Canadian residency training program at the time s/he e-mailed me for advice as to what to do. I advised h/er/im to go to the U.S. for a medical residency on a minister's permit (returning resident permit) but after talking to an immigration lawyer, s/he decided s/he didn't want to jeopardize h/er/is landed immigrant status so s/he has chosen to wait and will try to get into the OIMGTP or do a Master's program until s/he has h/er/is Canadian citizenship and try for a U.S. medical residency if s/he hasn't gotten a Canadian medical residency by then. Donald Alexander Smith, Lord Strathcona, started out as a country store clerk and died a peer of the realm, was chairman of The Hudson's Bay Company, Canadian Pacific Railway and numerous other Canadian companies and a great philanthropist. He donated money to McGill University so it would accept female medical students at a time when females were excluded from medical school (for reasons like they wouldn't be able to perform to the same standards as the men, the female sensibilities would be overwhelmed by what they would have to undergo during training, the female constitution wasn't fit for the rigours of studying medicine, etc. sounds familiar doesn't it), these female medical students called themselves the Donaldas in his honour. The Lord Stratchcona's Horse Royal Canadian Regiment which has a sterling record of courage in the Boer and other wars is named after him. The regimental motto is "Perseverance" which I think Canadian IMGs need a lot of. What is now a suburb of Edmonton was named after him as well as a county in Alberta, a provincial park in B.C. and hotels in Toronto and Victoria, although the village of Donalda in Alberta is not named after him.